Think of closing your front door one day and having all the Life you lived behind it disappear. You are not dead but the Life you lived is. The people where you drank your morning coffee are gone. The waiters are gone. Your job. The bar where you stopped on the way home. All gone. We spent the day before Hurricane Katrina at Squalor Heights, our Faubourg Marigny garret apartment. We watched television. New Orleans Mayor, Ray Nagin, spoke somberly in crisis appropriate but metaphorically odd phrases like, "Get out of Dodge." This is the Deep South, we thought, not the Wild West. By this time, The City had issued a mandatory evacuation order but offered no help doing so. Just the advice to "Get out of Dodge" if you can, pardner. If you can not saddle up and ride off, then write your old S. S. number on your arm with one'a them indelible magic markers. Yup! "This is the real deal," the big bossman reckoned. Jefferson Parish President, Aaron Broussard, said, "This is the 'Big One,' folks." A few days later, in Saint Bernard Parish -- the parish below Broussard's -- thirty-five Saint Rita Nursing Home residents drowned after days of pleading for help. One of them was Mother to Aaron Broussard's safety director. MR. AARON BROUSSARD: We have been abandoned by our own country. 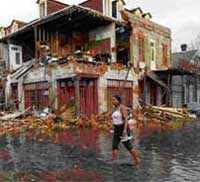 Hurricane Katrina will go down in history as one of the worst storms ever to hit an American coast, but the aftermath of Hurricane Katrina will go down as one of the worst abandonments of Americans on American soil ever in U.S. history. I am personally asking our bipartisan congressional delegation here in Louisiana to immediately begin congressional hearings to find out just what happened here. Why did it happen? Who needs to be fired? And believe me, they need to be fired right away, because we still have weeks to go in this tragedy. We have months to go. We have years to go. And whoever is at the top of this totem pole, that totem pole needs to be chain-sawed off and we've got to start with some new leadership. It's not just Katrina that caused all these deaths in New Orleans here. Bureaucracy has committed murder here in the greater New Orleans area, and bureaucracy has to stand trial before Congress now. It's so obvious. FEMA needs more congressional funding. It needs more presidential support. It needs to be a Cabinet-level director. It needs to be an independent agency that will be able to fulfill its mission to work in partnership with state and local governments around America. FEMA needs to be empowered to do the things it was created to do. It needs to come somewhere, like New Orleans, with all of its force immediately, without red tape, without bureaucracy, act immediately with common sense and leadership, and save lives. Forget about the property. We can rebuild the property. It's got to be able to come in and save lives. We need strong leadership at the top of America right now in order to accomplish this and to -- reconstructing FEMA. Let me give you just three quick examples. We had Wal-Mart deliver three trucks of water, trailer trucks of water. FEMA turned them back. They said we didn't need them. This was a week ago. Yesterday--yesterday--FEMA comes in and cuts all of our emergency communication lines. They cut them without notice. Our sheriff, Harry Lee, goes back in, he reconnects the line. He posts armed guards on our line and says, "No one is getting near these lines." Sheriff Harry Lee said that if America--American government would have responded like Wal-Mart has responded, we wouldn't be in this crisis. MR. BROUSSARD: ...that have worked 24/7. They're burned out, the doctors, the nurses. And I want to give you one last story and I'll shut up and let you tell me whatever you want to tell me. The guy who runs this building I'm in, emergency management, he's responsible for everything. His mother was trapped in St. Bernard nursing home and every day she called him and said, "Are you coming, son? Is somebody coming?" And he said, "Yeah, Mama, somebody's coming to get you. Somebody's coming to get you on Tuesday. Somebody's coming to get you on Wednesday. Somebody's coming to get you on Thursday. Somebody's coming to get you on Friday." And she drowned Friday night. She drowned Friday night. "We had tons of good times (at Saint Rita's), and we had one bad time. We had everything one day, and the next day it was gone," Saint Rita's owners, Sal and Mabel Mangano told reporters. The Manganos were charged, indicted and acquitted. At the national level no charges have been brought against anyone for the shoddy response to Katrina and Rita.